The Royal Yacht Britannia's Royal Barge has been back in the water for the first time in 15 years. 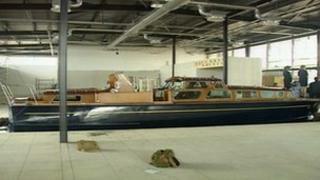 It underwent trials at Ocean Terminal in Leith ahead of a role in the Queen's diamond jubilee celebrations. The barge was used to transport the Queen to and from the Royal Yacht, until being decommissioned in 1997. It will be at the head of the royal procession of about 1,000 boats for the Thames Diamond Jubilee pageant on Sunday 3 June. The vessel will carry the Queen and the Duke of Edinburgh to the pageant barge The Spirit of Chartwell. The "Yotties", the Queen's one-time Royal Yachtsmen, will crew the boats and the last coxswain of the barge, Peter Young, will take the helm of the Royal Barge. Britannia carried the Royal family on 968 official voyages. It is said to have travelled over one million miles around the world. In January, the yacht was taken into a dry dock for maintenance. It was the first time the vessel had been moved in 14 years. About 2,500 litres of paint were used in the restoration work. It has now been returned to its permanent berth in Edinburgh and reopened to the public at the beginning of February.